A FREE GIFT straight to your inbox – With Deborah’s CHAKRA WISDOM Chart you can determine the state of your chakras, then clear, balance and charge them and receive Deborah’s weekly newsletter full of information to help you heal, grow and thrive! The Chakras are powerful energy fields in our body that hold the key to our physical, emotional and spiritual health. Deborah’s beautiful, full-color chart will help you decode the secrets of the 7 chakras. Learn to identify and repair blocked or damaged chakras so you can experience health, happiness and the light of higher consciousness. The word Chakra (चक्र) is derived from the Sanskrit word meaning “wheel,” “circle,” or “cycle.” Each one of us have 7 chakras, which are spinning energy centers that start at the base of the spine and move all the way to the crown of your head. When each one of your chakras is open and spinning properly (you don’t want them to be too open/closed or moving too quickly/slowly), Prana (or qi) — vital life force energy — flows freely and keeps you vibrant, healthy, and alive. However, should your chakras become blocked or unbalanced, energy will be unable to flow freely and openly and you may experience physical problems. 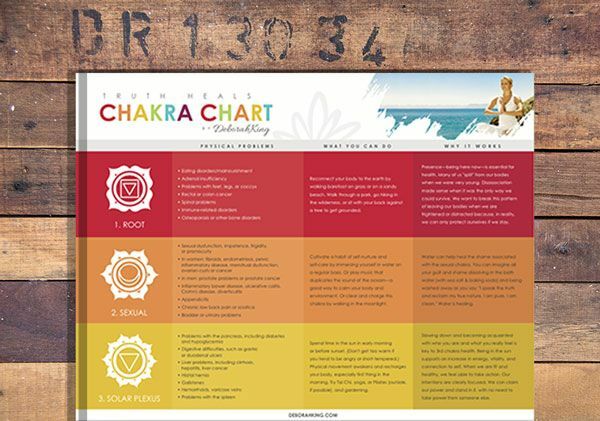 In this detailed Chakra Chart PDF, a free gift from New York Times bestseller and spiritual teacher Deborah King, you’ll learn how a blocked/unbalanced chakra can manifest in your body through physical and mental symptoms. This easy-to-use full-color Chakra Chart explains each of the chakras (with the corresponding 7 chakra symbols), the physical health symptoms resulting from blocked chakra energy, and what you can do to unblock and clear your chakras. Whether you are looking for more information on chakras for beginners or are a seasoned chakra energy healer, this Chakra Chart is a perfect quick-reference guide to help you become more in tune with the natural energy cycles of your body — so you can identify chakra problems before they spiral out of control and keep your life force energy centers healthy and fluid.